This article will describe how to connect your dotmailer account to Interact apps. Step 1: Login to your dotmailer account and mouse over the settings menu in the bottom left hand corner and select Access. Step 2: Create a new API User for connecting to Interact for the first time. Click on the API Users tab and click New User. Step 3: Here you will find your API Username (Email address) and you can provide a description and valid API Password for this API User. 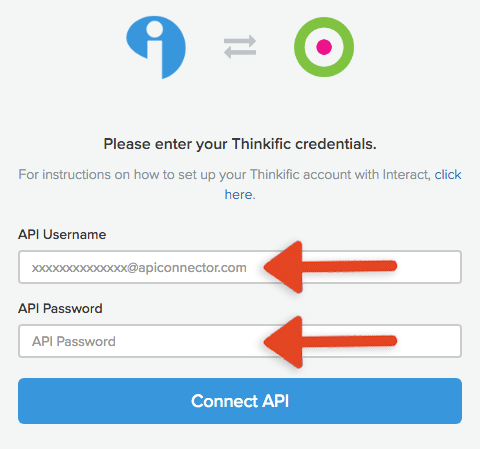 Step 4: Click Save and you will need these API User credentials for the next step. Step 1: In the Interact app builder, under "Connect your email list", choose dotmailer from the list of integrations. 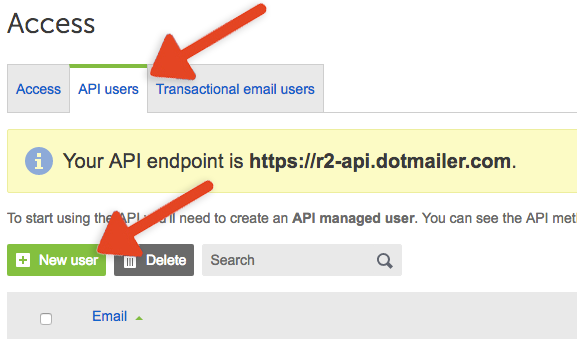 Step 2: Copy and paste your dotmailer API Username and API Password and click Connect API. Send Campaign: Choose a dotmailer campaign from the dropdown to send a dotmailer campaign to new contacts. 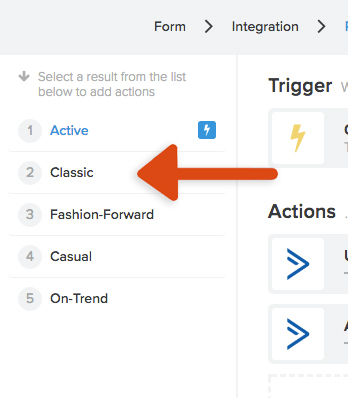 Example: For a quiz result trigger, you could connect different results to different campaigns to send autoresponders specific to the quiz result your customers received. Update Contact Data Field: Type an existing dotmailer contact data field name in the input box to update the contact data field for new contacts with a specific value. The value will auto-populate with the trigger name, but you can customize this with any value you want. Example: For a quiz result trigger, you could type in contact data field "QUIZRESULT" in the input box and populate the field with the quiz result title for your quiz. Step 1: You will have the option to disabled double opt-in for your opt-in form. Check the box to disable double opt-in for your contacts. This ensures dotmailer that you have permission to send users emails. Step 2: For all other fields, choose one contact data field from the dropdown that you would like to populate with the form value. Example: mapping Company Name to "COMPANY" will populate the value inputted for Company Name into the dotmailer contact data field "COMPANY". Will existing dotmailer users be updated? Yes, existing dotmailer contacts will be updated with updated field values and be added to new lists.